West Coast-based SaaS startup SubHQ seeks a Senior Ruby on Rails Engineer for a full-time, hands-on, leadership role. This person will report to the founder/CEO, code hands-on today and lead a team tomorrow — guiding the strategy and execution of the product, building the engineering team, and establishing the company and culture of a dynamic startup. SubHQ is looking for a senior manager to build our software engineering team and define our product vision. This is a strategic role that requires someone who is technically strong and passionate about our customer and our product. In addition to being the technical lead, you will provide vision and execution for our enterprise-class application written in Ruby on Rails. You will be a core member of the startup team and have the opportunity to influence product development and determine the technology strategy that aligns with the company’s strategic plan. The ideal candidate will have a strong technical background, a demonstrated track record as a professional leader who can build a team, and the business mind to strategically guide and prioritize the product roadmap. SubHQ is a modern web application built for construction subcontractors by a subcontractor. We empower subs to take control of their companies with real-time company & project management; streamlined safety compliance & quality control; improved productivity; increased equipment utilization & uptime; and effective & efficient change management. With SubHQ, subcontractors get complete real-time documentation and billing of above-contract change orders; real-time productivity and equipment utilization; real-time management-by-exception across all projects; paperless quality and safety compliance; and real-time fleet management and maintenance. SubHQ gives subcontractors the power to manage complexity with real-time field data. Big hands use small devices in the field to track project-specific requirements, payroll, equipment, quality, and safety compliance. Change management workflows track authorizations, documentation, and billing. And one-touch entry means the power to manage that complexity is efficient, streamlined and paperless. 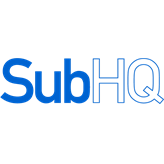 Want to get notified about new jobs at SubHQ?